Sander was a small jewelry company founded in 1938 and spanning to 1972. Their jewelry was usually delicate floral type pieces. They like to use a lot of enameling in their decoration as well. It is known for their craftsmanship and artistry. 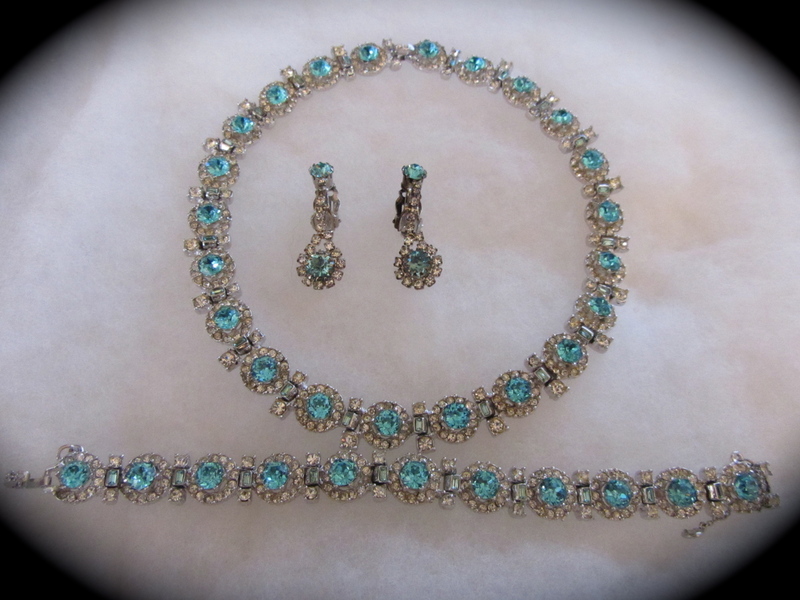 This parure of jewelry consists of necklace, bracelet, and earrings. A construction of blue glass beads and blue enameled leaves is the motif for this lovely set. 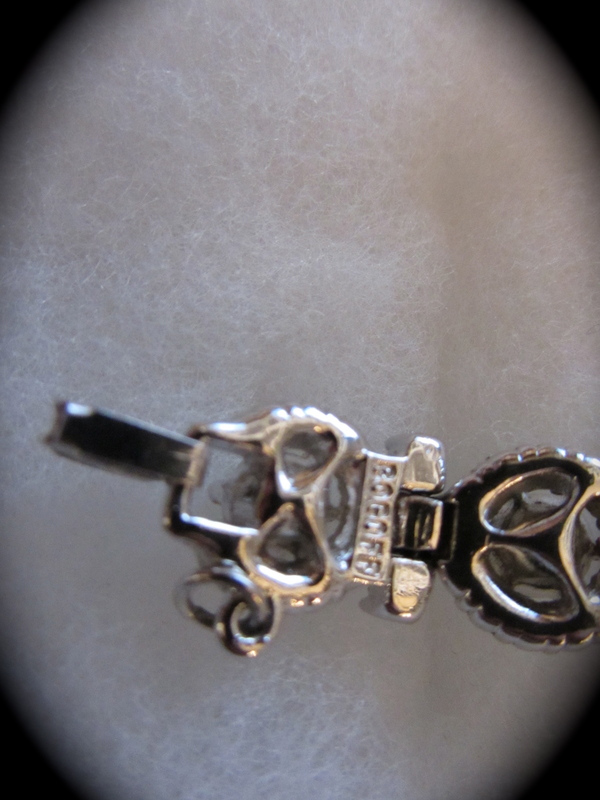 The necklace measures 16″ long and is adjustable. 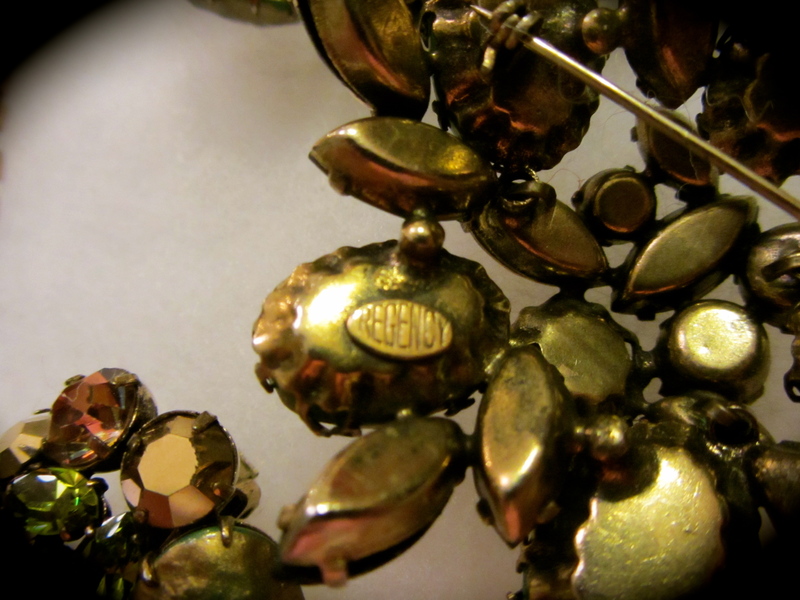 It is 3 strands with gold tone beads in between each bead. 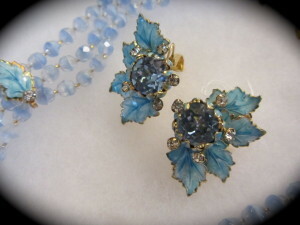 The center has a enameled leaf with a large blue rhinestone surrounded by 5 clear ones. The bracelet has a 5 strands of blue glass faceted beads with blue enameled flowers in the center and on the ends. This measures 7″ long. 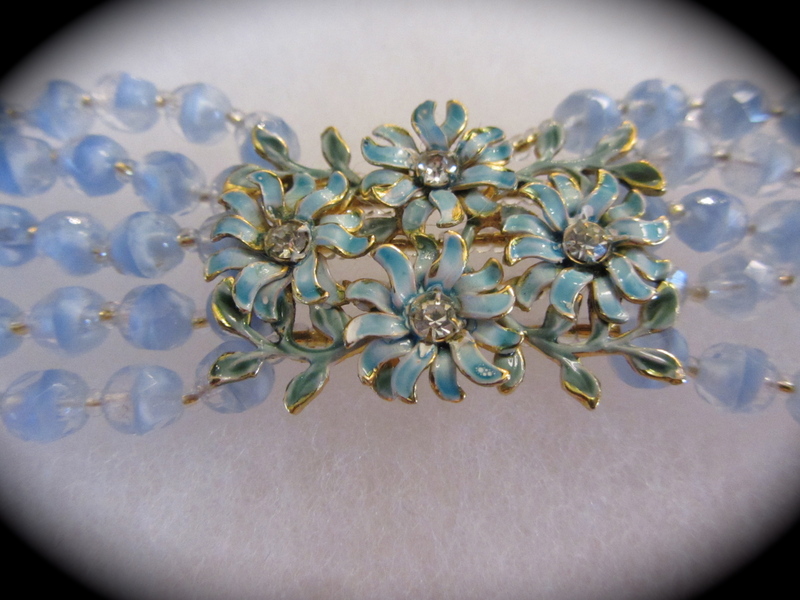 The little blue flowers have clear rhinestones in the center and sparkle like the sun! The earrings are a clip style and again have the blue enameled leaf on gold tone base with a large blue rhinestone in center. 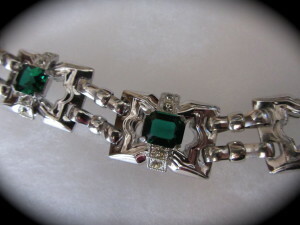 Hollycraft Jewelry was founded in 1938 and is always signed and dated. 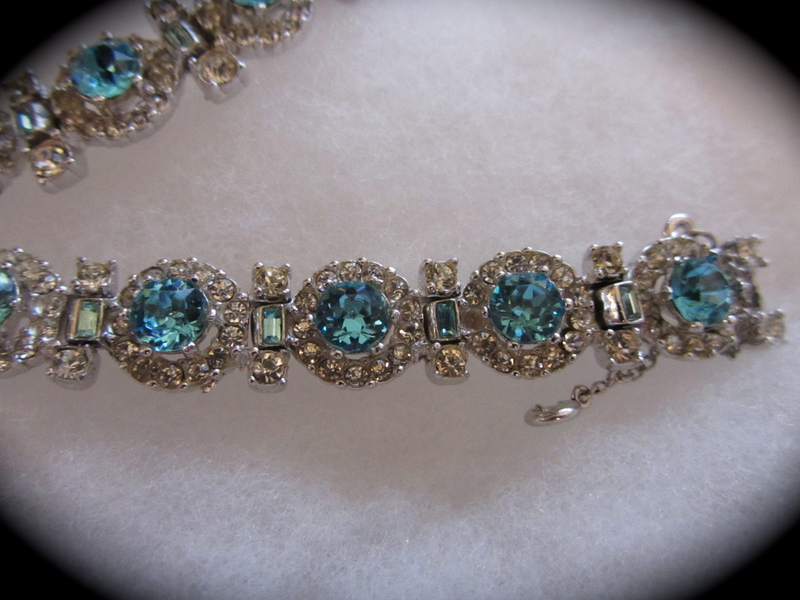 They got their start in the jewelry business renting jewelry to the movies and movies starts. Their best known for their Christmas pins and colorful and intricate designs. Bright and vivid stones, that have many facets and are quite an eye catcher. 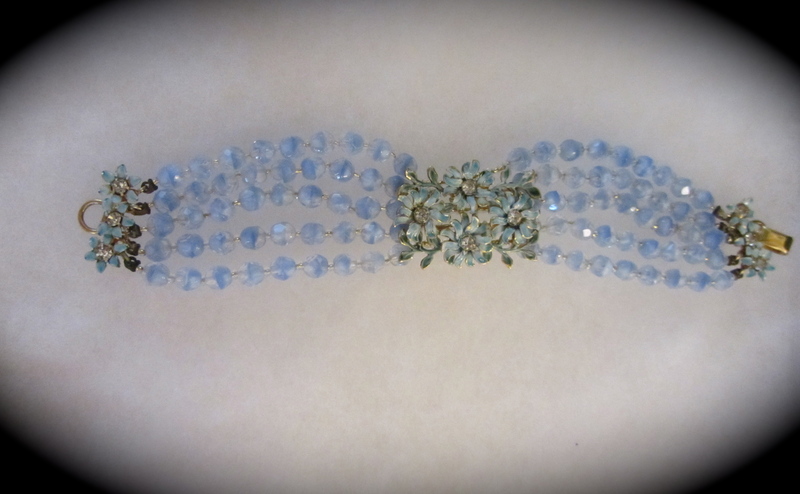 This bracelet measures 7″ in length and a little over an inch wide. Seven links are connected by 7 large pale purple stones. Such an innovative design that wraps nicely around your wrist and moves with you. An array of colors makes up this beautiful bracelet. Pale purples, pinks, blues, greens and yellows all different shades too! All of these colors are encased in a gold gilt. 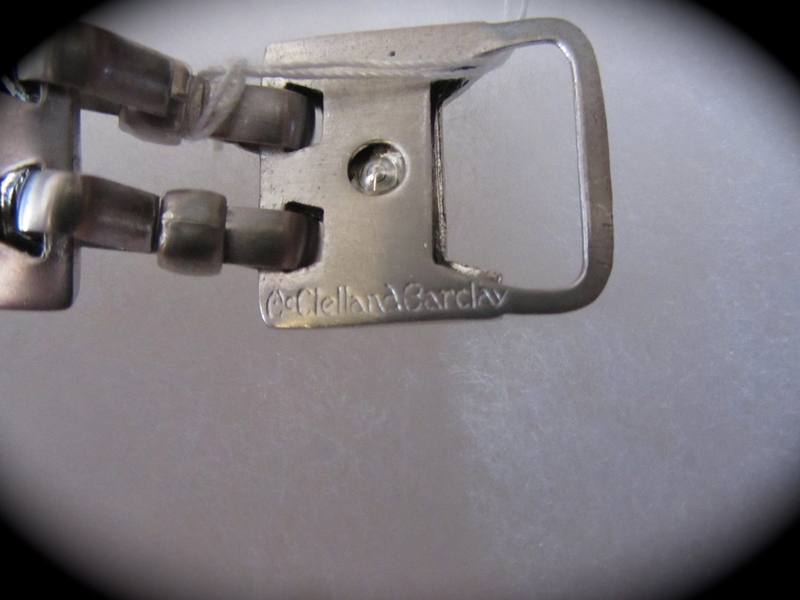 As with all good jewelry there is a safety clasp. Signed on the back: “1951 Hollycraft”. Rhodium plated with aquamarine and clear rhinestones. 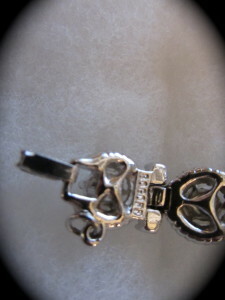 Necklace measures 14 1/2″, bracelet is 7″ with a safely clasp, earrings are clip style and hang 1 1/4″. All stones are present and sparkle like the day it was made. C1950 Based in Chicago. 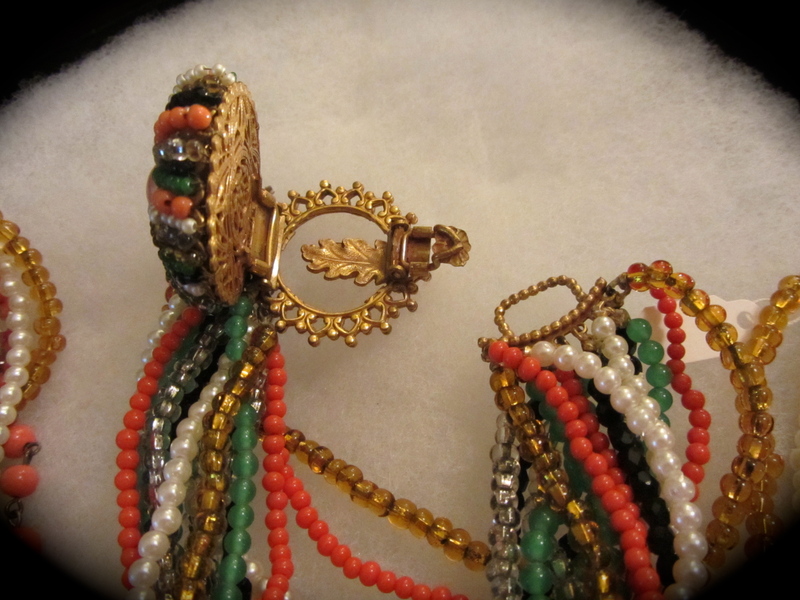 Bogoff made elegant and interesting costume jewelry that imitated high cost designer jewelry. Crafted from good quality materials the pieces usually had rhodium backings and hand set stones. 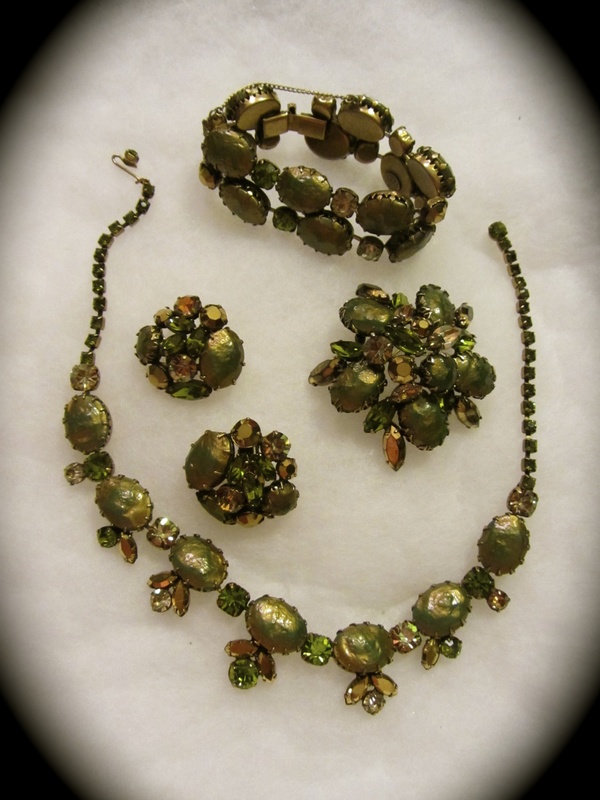 Gorgeous Kramer full parure set. 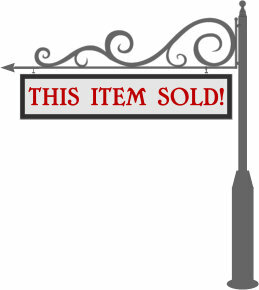 This includes: Necklace, bracelet, brooch, and earrings. Lots of detail to this lovely set. 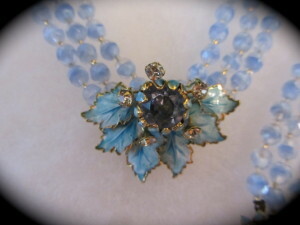 The necklace has gorgeous gold leaves in the center between the beads and gold spacers in between each bead at the end. this necklace measures 17″ long and is adjustable. 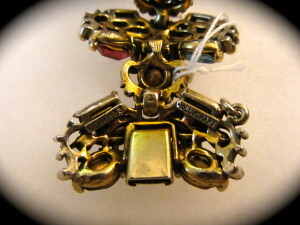 There are a group of 4 beads attached to the first row that hang down in the center part. Really nice movement to this piece. 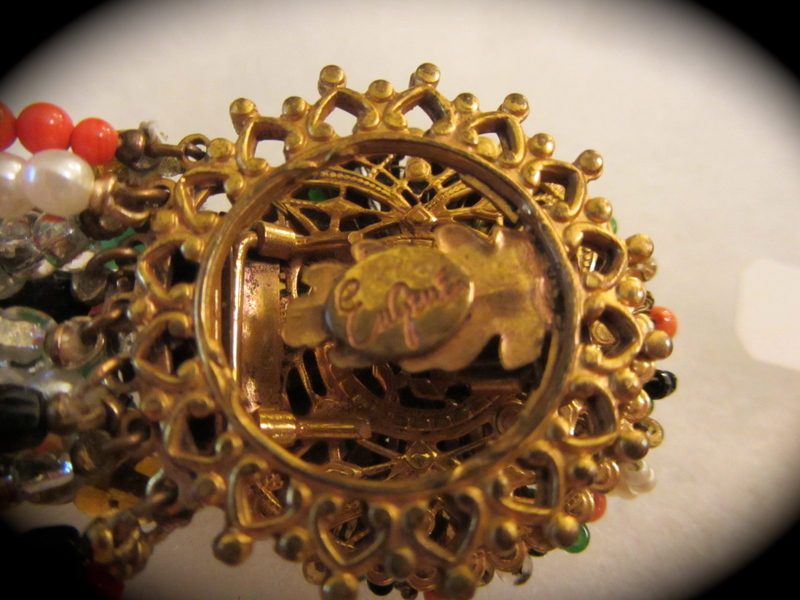 The bracelet follows the same pattern and measures 7″ long. the earrings are a clip style and have the gold leaf on the back with a group of beads cluster together and also have a bit of movement. 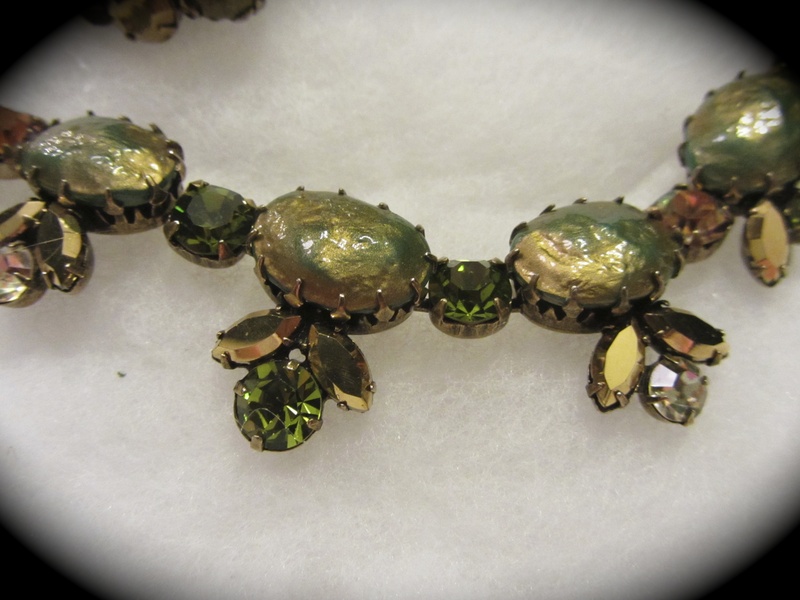 The brooch is 3″ long and has lots of moving beads too! Just a really fun set for summer! Original tags on this set too. I bet it was never worn by the looks of it. *This particular iconic late art deco set was an early work, made in the later part of the 1930’s – the gold or brass toned is exceptionally hard to find, and this silver or chrome finished even harder. This bracelet measures 7 1/2″ long. 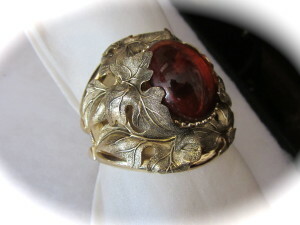 Chunky Whitings and Davis Gold tone bracelet with amber color stone in center. 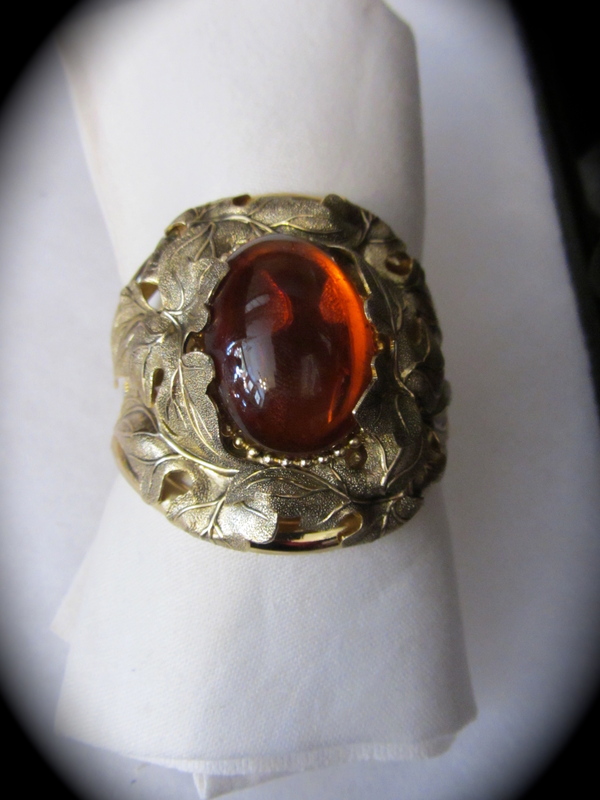 Such a simple classic style with a leaf motif around the large stone. 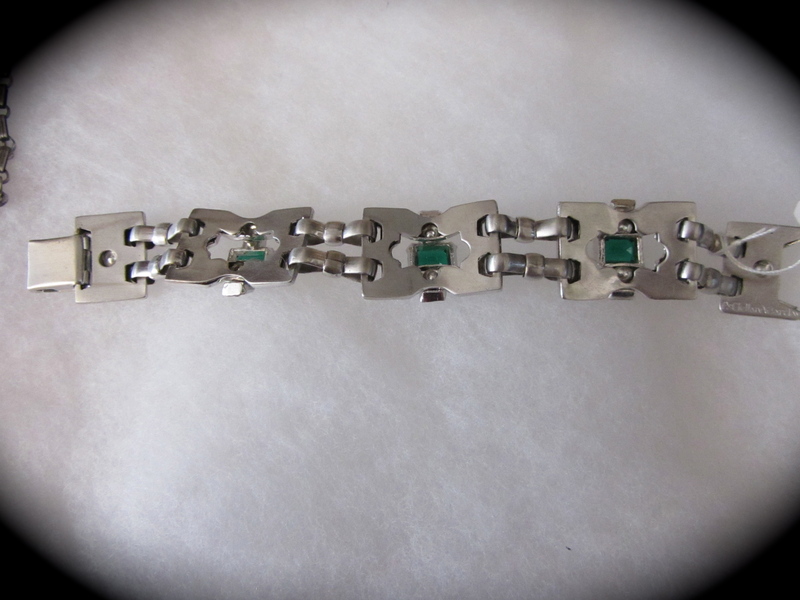 The one side of the bracelet has s spring clasp that opens on side to slip your wrist in. The bracelet is on the smaller side, it will fit a 6 1/2″ wrist. Marked on the inside: “Whitings & Davis Mesh Bags”. 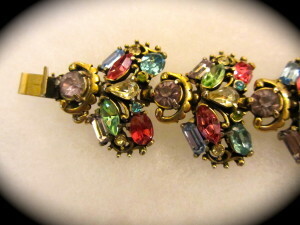 Vintage Bracelet and Necklace Eugene Brilliant Colors! 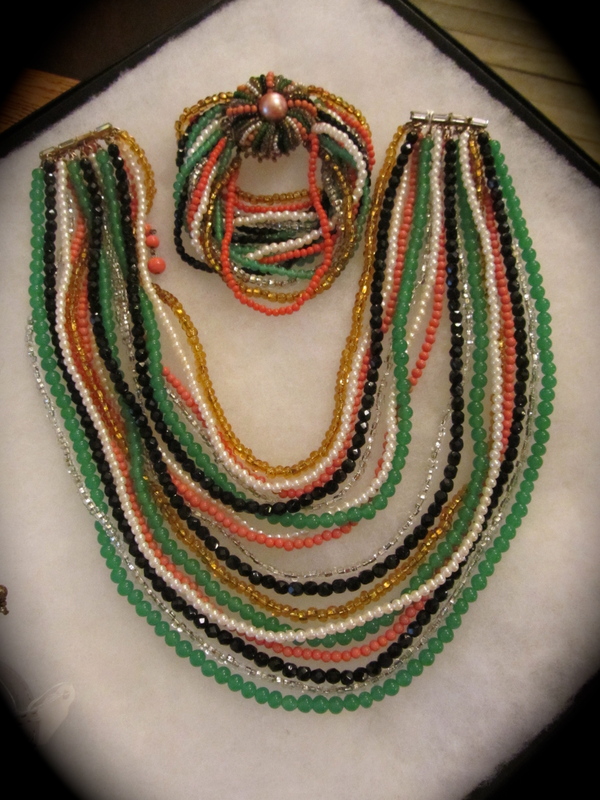 Vivid and brilliant colors make up this necklace and bracelet ensemble. The bracelet has 16 stands of glass beads. 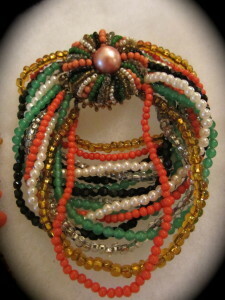 An amazing color combination of green, orange, amber, black, silver, and white pearls. 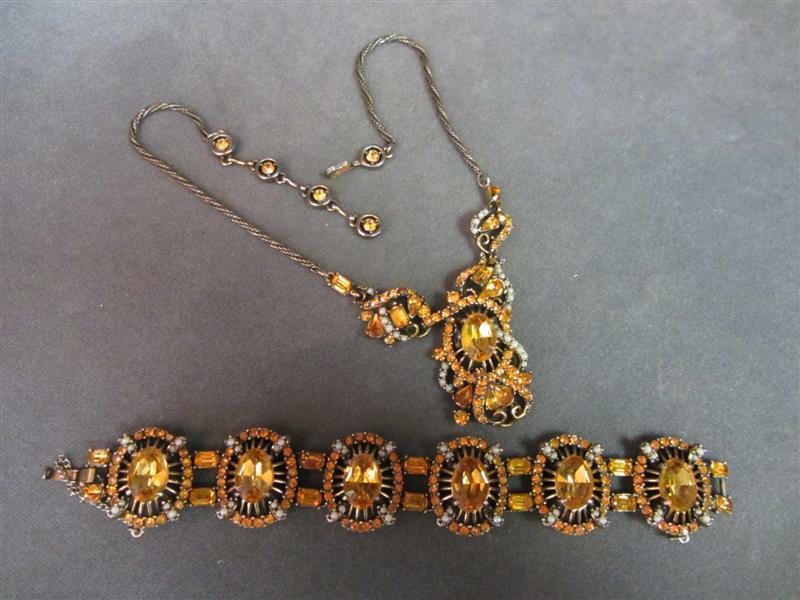 The clasp and the findings are all in gold tones. The bracelet measures 7 1/2″ long. 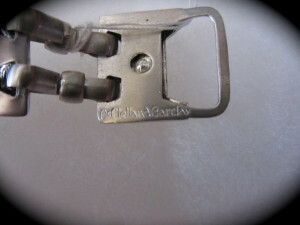 The clasp on the bracelet is really slick, see the photos below. The necklace has the graduated multiple strands and the smallest measures 18 1/2″. The findings on the end of the necklace are rhinestones that are emerald cut (4 on each side). The necklace is unmarked, but the bracelet is and they undeniably go together. 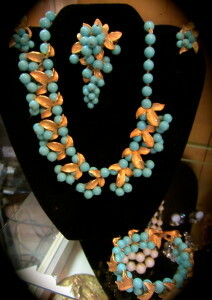 Eugene Shultz started his jewelry company in 1962 while he was still employed by Miriam Haskell. His business only survived 10 years. 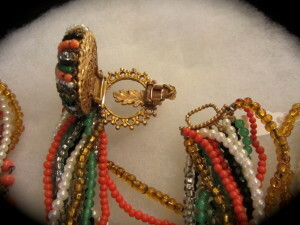 He is known for his unusual clasps and vivid colors. Well this is also quite a find! 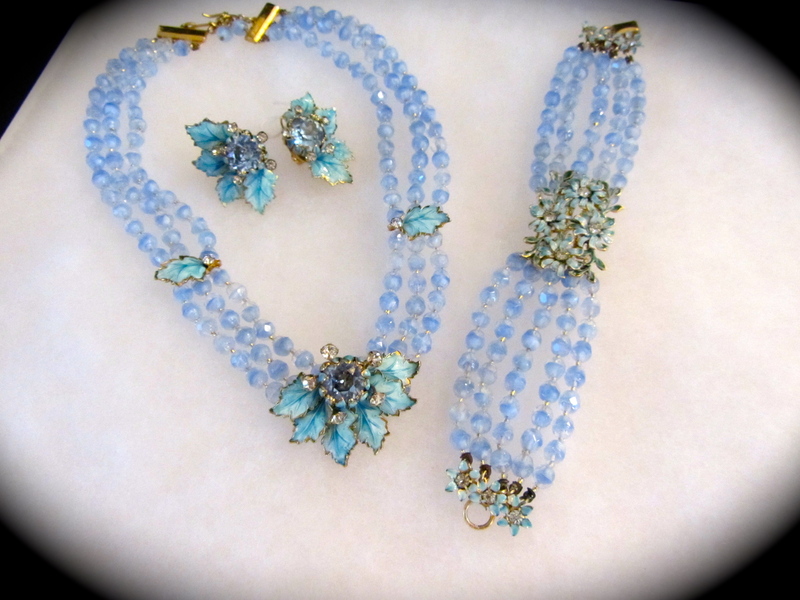 A full parure of Regency Jewelry. There is a necklace, earrings, brooch, and bracelet to this set. 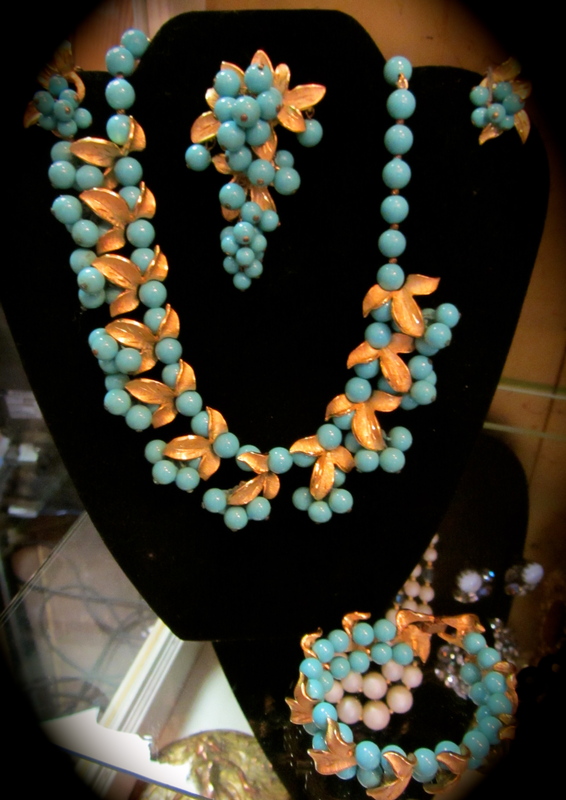 All prong set, gold plated and the most brilliant colors! Navette, round, and cabochons stones with an aura borealis finish. The large cabochons have a copper or gold that is swirled or marbled in them. All pieces are marked “Regency”. The necklace measures 16″ long. The are 7 large cabochons with green and champagne colored rhinestones in between. The earrings are clip and button style. They measure 1 /12″ in diameter. The brooch is “domed” and measures 2 1/2″ in diameter. 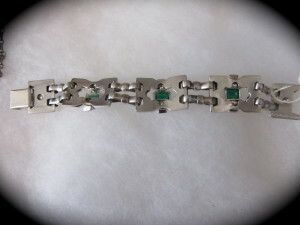 The bracelet has as safety chain and is 8 1/2″ long. All the stones are in excellent condition. 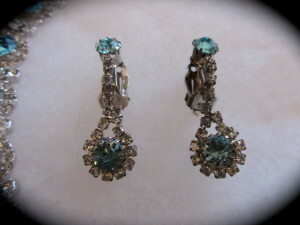 They have many facets and sparkle!!! 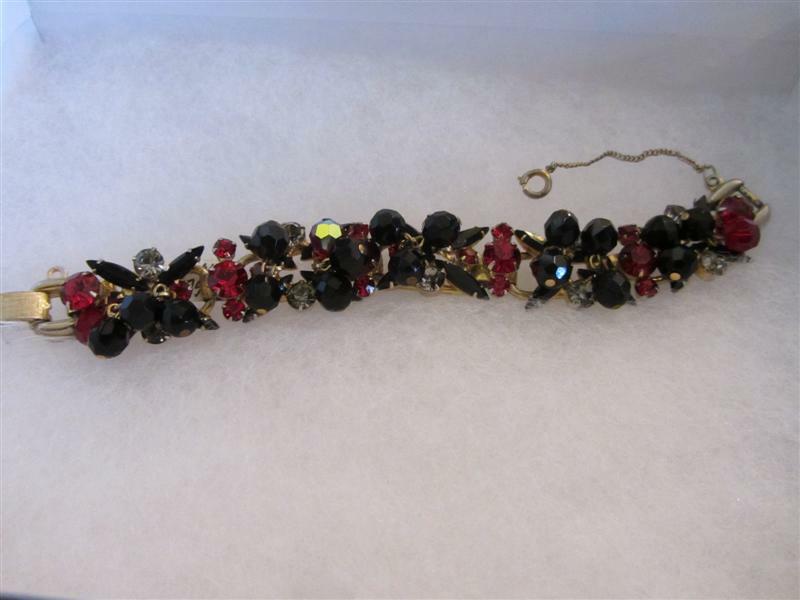 Fantastic Juliana Bracelet in the “Sticks and Stones” pattern. Vibrant red and black stones with some aura borealis stones just top off this fantastic piece. 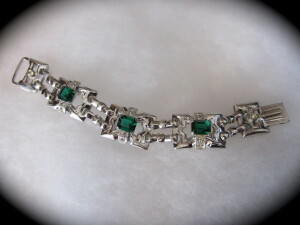 Such a quality piece with prong set stones and a safety chain too. Unmarked but distinguished by the “5 link” construction on the back. Set in gold tones.